I know! That is why I had to buy it at a flea market. I was totally amused by the shape of this hammer. It was even more fun to carry it around as my Sis and I continued to cruise the flea market. I think it is a riveting hammer of a by-gone profession. I really don’t know for what or how it was used. Any ideas? I don’t use it but it is part of my hammer collection. One of the many reasons I love being a metalsmith is the opportunity to buy and learn to use new tools. We’ll be exploring my studio to see some of my favorites and how I use them. Here’s a preview of what’s to come. You cut it all by hand? What I can’t live without. 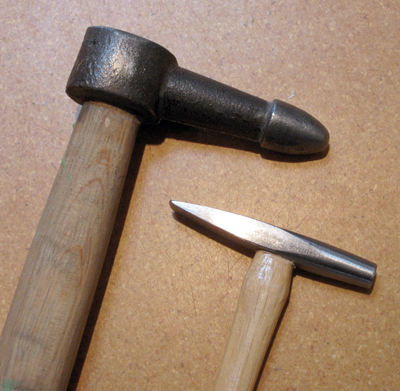 BTW this is my riveting hammer, a bit different in shape and size, but a similar function.